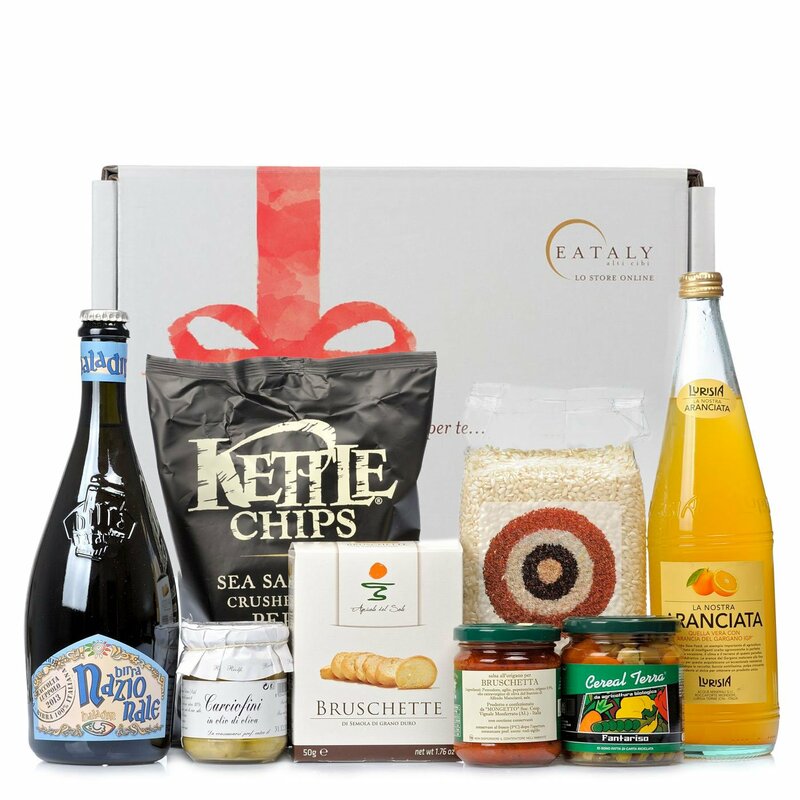 For those who simply want to spend an evening with friends and enjoy a selection of delicious and wholesome food, Eataly offers an assortment of the most exquisite products that can be perfectly combined to offer the perfect aperitif session. Ingredients Oregano Bruschetta Sauce 180g:Tomaten 88,58%, Knoblauch 5,32%, Chili 3,55%, Oregano 0,88%, Extra natives Olivenöl 0,88%, Salz 0,79%. ALLERGENE: Enthält keine Allergene. Small Artichokes in Oil 180g:Ganze Artischocken 60%, Olivenöl 40%. Reststoffe: Weinessig, Salz; Säureregulator: Zitronensäure; Antioxidationsmittel: Ascorbinsäure. ALLERGENE: Enthält keine Allergene. Sea Salt and Black Pepper Chips 150g:Selected potatoes, sunflower oil, maltodextrin (from potatoes), potato starch, sea salt, black pepper, yeast extract, white sugar, acidifier: citric acid extracted from sugar beet molasses, black pepper extract. Chianchette 250g:remilled durum wheat semolina, extra virgin olive oil, white wine, salt, wild fennel. Contains gluten and sulphites. Carnaroli Rice 1kg:Italian Carnaroli rice. Aranciata 0.75l:water, orange juice (12%), cane sugar, extracted infusions and natural vegetable flavourings (Gargano orange IGP infusion, variety Duretta - Biondo), carbon dioxide. Contains no preservatives or colouring agents. 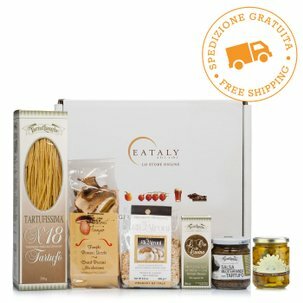 An Eataly hamper for lovers of wholesome foods. Contents: 1. Bruschette 50g - Agricola del Sole, 2. Baby Artichokes in Oil 180g - Riolfi, 3. Nazionale beer 0.75l - Baladin, 4. Black Pepper Chips 150g - Kettle, 5. Bruschetta Sauce 180g - Il Mongetto, 6. Carnaroli Rice 1kg - Gli Aironi, 7. Fanta Riso 250g - Cereal Terra, 8. Orangeade 0.75l - Lurisia, 9. Large Gift Hamper 40X35X18.